SHAKIA JOHNSON, born and raised in Springfield, MA, is a graduate of Pioneer Valley’s Performing Arts Charter High School and Dean College. She received her teaching artist certificate from the National Dance Institute in New York in 2009. Johnson has choreographed and directed more than 40 hip hop, modern, African and lyrical works that have been performed at Trenton Educational Dance Institute, Rider University, the Princeton School of Ballet and the Bates Dance Festival. She has performed for numerous hip hop events and has opened for concerts by Fat Joe, Jadakiss, 112, Charlie Baltimore, Kima from “Total” and Omarion. In 2005 she choreographed a hip-hop number for the Celtics/NBA half-time show. She has toured the U.S. and abroad dancing with Face Da Phlave Entertainment and Illstyle and Peace Productions. She currently teaches Hip Hop Dance and Culture at Pioneer Valley Performing Arts High School, Mount Holyoke College,Amherst and Smith College. She is faculty at Bates Dance Festival and will be teaching the Young Dancers Aorkshop and the Professional Program this summer. After discovering dance around the age of 18, ANGIE WOLFRAM quickly committed to the art as a source of body and self-awareness, expression, discipline, healing, and joy. Angie found her home through house music and culture, and she fuses styles from this lens. She gets the most pleasure from dance by digging to the historical and cultural root of each movement style to further her understanding of self and body. She is deeply influenced by music and movement of the African diaspora and chooses to pay homage and give thanks through the cypher. Angie is a student of many disciplines, including those under the umbrella of street and funk styles (hip-hop, popping, locking, waacking, punking, house, to name a few). Some of her secondary influences include salsa, bachata, samba, lindy hop, ballet, modern, tap, and Capoeira. SEAN BJERKE began tapping into his body's movement potential as a TaeKwon Do student in 1991. 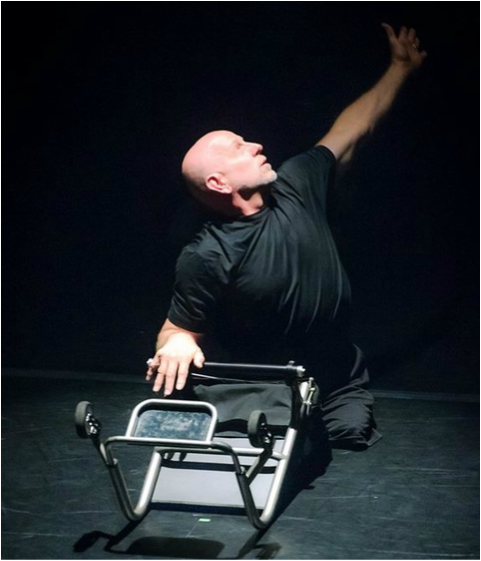 Always curious to stretch his physical limitations, Sean put his martial arts training to new use when he joined a student dance organization at Tufts University. He quickly developed a passion for performing onstage, and soon became the director of the Tufts Dance Collective. After graduating, Sean fell in love with the rawness and physicality of street and club dance styles after joining his first dance company, Unyted Stylz, in 2006.With Unyted Stylz, Sean eventually became a co-artistic director and co-produced 5 stage productions. Sean was introduced to many street styles such as Hip Hop, Locking and House, and found himself gravitating towards House due to its complexity and challenging footwork. Sean became so interested in learning House, he would later became an online student of Jardy Santiago, a House specialist on the West Coast. Despite the 3000 mile separation, while learning from Jardy, Sean learned how to dance more independently to the point where he began regularly venturing out to Boston clubs to work on his dancing. Elevating his House training has opened up many opportunities for Sean, who is one of the only active House teachers in Boston. Today, Sean is the co-artistic director of CONcept ARTists, a Boston based dance company, and regional leader in urban-influenced choreography. In June 2016, Sean co-produced CONArt's first dance showcase, CONcentrate on the ARTistry, a celebration of urban dance in New England. In addition to directing CONcept ARTists, Sean is a faculty member at The Jeannette Neill Dance Studio where he contributes choreography to the studio's seasonal concerts, and challenges his students' footwork in his weekly House dance classes. Sean is also a member of the Beantown Lockers (BTL), a dance group dedicated to spreading Locking to Boston and its surrounding areas. In October 2016, Sean helped BTL organize "Vaudeville Funk," a Locking showcase featuring Locking creator, Don "Campbellock" Campbell and his son Dennis Danehy. It was the first Locking show in Boston since 1983. Despite all his choreography credits and teaching responsibilities, Sean remains a student first, and immerses himself in classes whenever he can. He still trains Tae Kwon Do, his first love, to this day. In December 2015, he became a Master in TKD by obtaining his 4th Dan Black Belt. THORN LIM has been dancing for over 15 years. He has danced with Rainbow Tribe which is a jazz based dance company and moved on to dancing with a group of friends in a group called Side Project aka SidePro. The group eventually became known as CONcept Artists.Thorn was exposed to a lot of the street styles but found house to be the most natural fit for him.He's been training in it ever since. MEGHAN MCLYMAN is an Associate Professor of Dance at Salem State University in Salem, MA. She graduated with a BA in dance from Point Park University, received an MA in dance and arts management from American University, and an MFA from Hollins University in partnership with the American Dance Festival. Meghan has taught courses at various dance programs including The Colleges of the Fenway, The College of the Holy Cross, James Madison University, North Quincy High School, Green Street Studios, and Avery Ballet. She has held master classes at Moving Target Boston, Tufts University, MIT, Webster University, the American Dance Festival, the American College Dance Association, and at the Massachusetts Association for Health, Physical Education, Recreation and Dance. Meghan has performed with The Caitlin Corbett Dance Company, 4 Square, The Falling Flight Project, Digby Dance, The Moving Laboratory, Flip Side Dance Theatre, Sister's Trousers, and with The Avery Ballet. She is a board member of the American College Dance Association and the President of the Massachusetts Dance Education Organization where she facilitates conversations and events around teaching dance. Meghan also dances the role of Anna with her four year old daughter Karley, a.k.a. Elsa. Other Credits include: Performed at Emerson Spring to Dance Festival in St. Louis 2009 (Ashes), Tango # 4 (2010), Indecision (2012), Duets for my Valentine Tango # 4 (2009), Dance Chicago Ashes (2005). Lenzo has attended Axis Dance summer intensives 2005 & 2010. He is a teacher in MOMENTA's Everybody Can Dance Workshops for dancers with and without disabilities (2006- present). DAWN MORROW has been dancing for over 20 years. She grew up in Jacksonville, Florida where she trained and taught at local studios, as well as danced with The Florida Ballet. In 2005, she moved to Los Angeles. Some of her credits include: Nickelodeon’s Victorious, recurring appearances on The Tonight Show with Jay Leno, over 20 music videos, films such as Walk Hard and Struck By Lightning, National commercials for brands such as Coca-Cola, Tampax and Kia, toured with Keke Palmer, and has had the opportunity to work with choreographers such as Anne Fletcher and Michael Rooney. She currently is a Principal company member in the Antelope Valley Ballet and also performs with the modern company Hidden Entropy Movement Project (HEMP). NATE ODELL hails from Western Massachusetts. He started acro-training at the age of three at The Hackworth School of Performing Arts, which led him to try his first hip hop class at age four. Odell danced the competition circuit, winning titles: ADA Young Dancer of the Year 2003, Onstage Teen Dancer of the Year 2011, and ADA Young Choreographer of the Year 2012 (in collaboration with Jonny Forance). He has trained under choreographers: Travis Wall, Chaz Buzan, Nick Lazzarini, and Albert Cattafi through a summer dance workshop called Generation IV Dance (2009-2014). Odell studied primarily under teachers Teddy Forance, Alison Forance, Lisa Anthony, and Lisa Heath at Hackworth. Odell transferred to Pioneer Valley Performing Arts (PVPA) in South Hadley, MA during his junior year of high school. There he trained under the direction of Jen Pollins, Jodi Falk, Alpha Kabinet Kaba, Ann Biddle, and James Morrow. Odell was a member of Catalyst Dance Company, PVPA’s pre-professional Dance Company (2012-2014). In Catalyst, Odell danced the works of Bill T. Jones, Summation Dance Company, Jen Polins, Jodi Faulk, and James Morrow, and also choreographed his own works. For his senior thesis at PVPA, he produced, choreographed, and danced, in collaboration with MaijaLisa Miltz and Andiyah Patrick, a dance performance entitled, “three.” which sold out both performances and received rave reviews. Upon graduation, James Morrow approached Odell with the opportunity to join his company, james morrow/ The Movement. He is currently studying at Calarts in Los Angeles, CA. Born in Jacksonville, FL, KASEY KERR began her training at the Shoshannah Arts Dance Conservatory (SADC). Kerr toured to parts of Scotland, England and The Island of Montserrat while dancing at SADC. She continued her education and dance training at Florida State College of Jacksonville (FSCJ), where she received a full dance scholarship and her Associates in Arts degree in dance. While attending FSCJ Kerr was a dance assistant in many classes, was rehearsal director for selected choreographers, and performed pieces by Rosemary Fletcher, James Morrow, Paige Ricci, Rebecca Levy and Lebritia Sendijah. Kerr was also exposed and danced the works of renowned guest artists Bernard Gaddis, Tony Parisi, Attila Csiki, Edgar Zendejas, BJ Sullivan, Amy Baker and many others. Kerr was offered a company position with the Chicago based dance company, The Massive, to perform in their 2011 production of “FAUST”. While living in Chicago she took classes at the Joel Hall Dance Center, Lou Conte Studio and Visceral Dance Chicago. Since returning to FL., Kasey has performed with Weird Al Yankovic, Braided Light Dance Project and Emily Cargill. Kerr's wish is to continue dancing, learning and traveling wherever her passion and love for dance may take her. BRANDE LEE has been training and performing circus/aerial arts since 2009. She specializes in aerial silks, lyra, hammock, pole, and hoop dance. She got her start with Orange County Aerial Arts/Ruby Karen Project (OCAA/RPK) in September 2009 and still receives continuing education and performs with them to this day. Brande also trained at the New England Center for Circus Arts (NECCA) in their 2013-2014 Intensive Training Program. She has performed with OCAA, CIRCO Etereo, james morrow/The Movement, Wire Monkey Dance, Elevated Aerial Dance, SHOW Circus Studio, and was an aerialist in the Cirque de la Mer show at Sea World, San Diego for their 2014 and 2015 seasons. Brande participated in Aerial Arts America's 2nd Annual West Coast Aerial Arts Festival (WCAAF) November 2014. She placed 1st in her category, tissu/silk professional, and 1st overall. She was also selected and competed as a finalist in the silks category for the inaugural U.S. Aerial Championships in New York City February 2015. Brande is certified in group fitness through the Aerobics and Fitness Association of America (AFAA) and has been teaching aerial arts since 2012. She has received teacher trainings through OCAA/RKP, Circus Arts Institute (CAI), AURA Pole Dance Fitness, and SHOW Circus Studio. Brande has worked with numerous aerial schools and programs around the country teaching aerial and circus classes and specialty workshops including, AirCraft Aerial Arts; Circus Up! ; Boston University; SHOW Circus Studio; Aerial Athlete; Bittersweet Studios; OCAA/RKP; CAI. Brande has a passion for circus arts and loves to share her joy of fun fitness and performance art. IAN SANITY TARTASKY is a Boston based contemporary artist who uses the urban landscape around him as direct inspiration for the bizarre world he creates through his art. With a Bachelors Degree and an Associates Degree in illustration and a background in design and fine art, Ian combines many skills and techniques to paint his dreams from the abstract to the scary to the surreal and so on. Limited by only his own imagination Ian creates an extensive catalog of work that touches on all walks of life, as he is inspired by everything he sees and dreams.